Calendars. Everyone needs one, but they’re never very personalised, are they? Ironically, they inherently become the most personalised item a person could own; and yet, they all look the same, with lines upon lines of similar looking entries, month after month. That’s no way to live (even though we’ve been doing it for years). You need to get excited about the things you’re doing, the plans you’re making, the people you’re seeing – it’s your life to live after all. JotTheDate is a brand new app that’ll help you get the most out of your calendar, by injecting a healthy dose of fun into the proceedings. It’s also free, and out now for iOS. If you were a child, you might dream up the kind of calendar that JotTheDate brings us. And that is very much a good thing, because one thing that JotTheDate is not, is boring. It’s a lot of fun, often humorous and very creative; as well as being a gentle reminder not to take all of life too seriously. 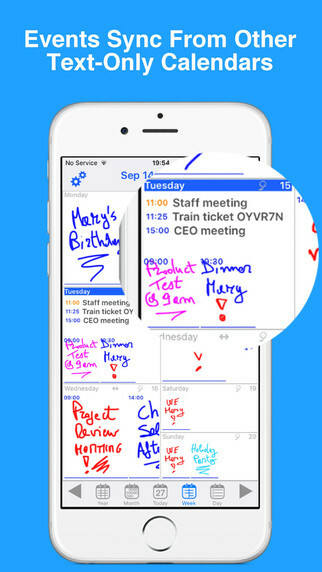 The idea behind the app is that instead of typing in appointments and reminders into your calendar, you draw them in. So you have free rein over what you want to scribble down on a particular date, be it a drawing, a logo, a word, a name or a symbol. The app lets you choose your colour and brush size, so you can personalise your appointments whichever way you see fit. For instance, if you had an appointment with the doctor, you could draw a stethoscope. If you had a friend’s birthday party on, you could draw a cake, and if you had a meeting with the bank, you could draw an inverted cross. They say image association lends itself to better memory, so this method has the added bonus of helping you remember those all-important dates, such as anniversaries or numerous birthdays. As well as that, the app comes with a host of features to make your life easier, such as integration with iCloud and iDevices (even the Apple Watch), several viewing options which allow you to switch between days, weeks, months and years, and the ability to set reminders, just in case the pictures aren’t doing enough for you. There’s also the added bonus of being able to use JotTheDate offline, even to the extent of editing dates. All in all, this is a unique and creative little app that brings a lot of fun and a good bit of levity to the usually formulaic proceedings of a calendar. Check it out! Make a date with the App Store and start planning for free today!